Public areas are at risk of someone becoming sick or injured. This spill kit proivdes a way to contain body fluids and clean up contaminated area. Public areas are always at risk of someone being injured or sick. This Public Area Spill Kit is essentially a HazMat Spill Kit that provides an effective way to contain body fluid waste and clean up a contaminated area. Ideal for any business where the general public congregates, such as dining areas, pools, lobbies, and waiting rooms. 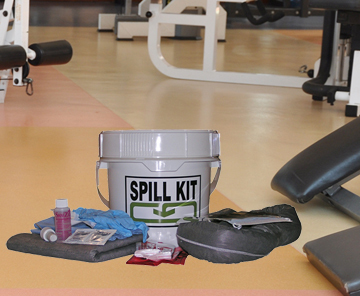 Use the Public Area Spill Kit to clean up body fluid including blood, urine, or vomit. These liquids may contain viruses, bacteria and parasites that can spread to other individuals if not cleaned up immediately. This kit is packaged in a 2 gallon UN approved pail with a screw on/off lid for easy access. Shipping rates are estimates only and do not include fuel surcharges that change daily. Actual rate may vary.